Corbin Miller's emergence as a three-point shooter was decisive in the team's victory in its first Ivy League game. Entering Saturday’s Ivy League opener against Dartmouth, the Harvard men’s basketball team had thrived or perished based on the performance of reigning Ivy League Player of the Year Wesley Saunders ’15. Against the University of Massachusetts in November, Saunders netted 27 points, including the game-winning shot with 38 seconds left, enabling the Crimson to defeat a squad that Harvard head coach Tommy Amaker then labeled the “best team” the Crimson had faced. The following month, when Harvard faced the University of Virginia (easily the strongest opponent on its schedule for the entire season), Saunders failed to sink a field goal, and the Cavaliers throttled the Crimson by 49 points. In Hanover on Saturday, Harvard learned what it was like to compete without Saunders. Battling foul trouble throughout the night, the senior guard played only 19 minutes and sat for pivotal stretches. Fortunately for the Crimson, other players—most notably Corbin Miller ’15 (’17)—stepped up, helping Harvard begin conference play with a crucial victory (the team is now 10-3 overall) and signaling that this team has begun to discover the balance and poise of Amaker’s previous Harvard squads. Less than two minutes into Saturday’s contest, Harvard point guard Siyani Chambers ’16 spied classmate Agunwa Okolie creeping behind the Big Green defense and tossed a lob that Okolie flushed home. Paired with a jumper by Chambers and a layup by Saunders, the alley oop helped the Crimson race to a 6-0 lead in the first two and a half minutes. Harvard appeared to be on its way to a blowout. A mere six minutes later, the Crimson were clinging to an 8-6 lead. Buoyed by four points from Gabas Maldunas, an All-Ivy post player from Lithuania, the Big Green had begun to score. Meanwhile, the Crimson offense had gone dormant, with only Okolie registering a field goal. Most alarming, Saunders was sitting on the bench with two fouls. Suddenly Harvard seemed vulnerable. Enter Miller. Prior to this season, many had tabbed the second-year swingman, who missed the last two seasons while on a Mormon mission, as the strongest candidate to replace Laurent Rivard ’14, the most accomplished three-point shooter in Harvard history. On Saturday, Miller showed why. Sign up for Harvard Magazine’s basketball e-mail and follow the Crimson all season long! David L. Tannenwald ’08 will provide the latest news, game summaries, and insights as the Crimson chase another Ivy title and NCAA berth! With just over 10 minutes left in the first half, he caught a pass from Okolie and launched a three. Nothing but net. Seventy seconds later, he trailed Chambers in transition, accepted the pass, and shot another high-arcing long ball. All nylon. With just over eight minutes left in the half, the six-foot-two guard showcased his versatility. Holding the ball near half court, he accepted a screen from Steve Moundou-Missi ’15, penetrated, and shot-faked his defender before swishing a mid-range jumper. Miller might not approach Rivard’s three-point shooting records, but the move demonstrated that he can offer something different: the ability to take his man off the dribble. More important, when paired with yet another three, the shot gave him 11 points in the first half and helped stake the Crimson to a 27-20 lead. The pattern continued early in the second half. Barely 90 seconds into the frame, Saunders returned to the bench after picking up his third foul. In came Miller, who knocked down another three just over a minute later, pushing the lead to 11. He scored just one more basket the rest of the way, but after Saunders returned—only to promptly pick up his fourth foul and again exit the game—Miller sustained his impact by containing Alex Mitola, one of the best three-point shooters in the conference and the player whom Saunders had been guarding. 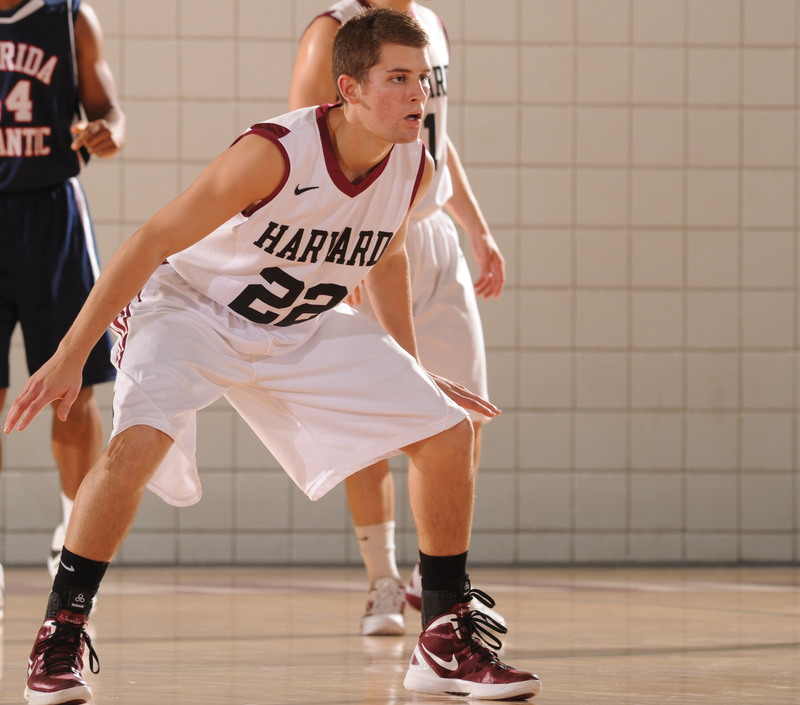 With Miller hassling him, Mitola sank just one of five shots in the second half, and Harvard captured a 57-46 victory. Myriad players contributed to this victory—but had it not been for Miller, Harvard would not have won. Throughout his time at Harvard, Amaker has preached the importance of offensive balance and inside-out play. But for much of this year, the team’s offense has revolved almost exclusively around Saunders (see “A Work in Progress”), and the Crimson’s big men have struggled to get touches in the post (shooting opportunities close to the basket). But on Saturday, four players—Miller, Saunders, Chambers, and Kenyatta Smith ’15—scored in double figures, and Okolie added eight points. Moreover, Smith, a six-foot-eight center, scored most of his points on a series of post moves, suggesting that Harvard has begun to rediscover the inside presence it had been lacking. As important as making specific plays is the fact that the team, which had appeared overwhelmed during its holiday visit to Charlottesville, had regained its poise. Even though the squad lacked its best player for more than half the game, it maintained a significant lead for most of the evening and withstood the Dartmouth run that cut the gap to five points with roughly 13 minutes left. Given that Harvard was opening conference play on the road (a combination that Amaker called “incredibly difficult”), the victory suggested that the players are becoming tougher and more confident. Room for improvement nonetheless abounds. Although the offense performed better, the Crimson had a pair of four-minute stretches when they did not make a field goal. They must become more consistent. Another priority is reducing turnovers: the Crimson had 17 giveaways—six from Chambers. Their big men could also be less careless: Moundou-Missi and Smith had a total of 16 rebounds, but they also let several balls squirt out of their hands. In conference play, every game—every possession—matters too much to let the miscues go uncorrected. And now the calendar counts: after facing off against Boston College Wednesday and closing out-of-conference play against Bryant next Tuesday, Harvard hosts Dartmouth on January 24, before commencing the six consecutive weekends of the Ivy League’s traditional back-to-back games. This stretch will determine whether Amaker and company claim Harvard’s fifth consecutive conference title. Thus, while most undergraduates are luxuriating in intersession, the basketball team is preparing for its next set of final exams. • Before traveling to Hanover, the Crimson posted an 84-38 win over Saint Rose, a Division II opponent. The 46-point margin of victory was the largest of the Amaker era. • Although Harvard’s offense has been erratic, its defense has yielded just 55.3 points per game, the tenth-best scoring defense in the country. • The men’s basketball team started league play on a strong note, but the Harvard women’s team began conference competition by losing at home to Dartmouth 76-61. After the game, head coach Kathy Delaney-Smith lamented her team’s “horrific” shot selection, 17 turnovers, and mental lapses on defense. David L. Tannenwald ’08 is a Cambridge-based writer focused on the intersection of sports and society.